License plate frame-Alumni. 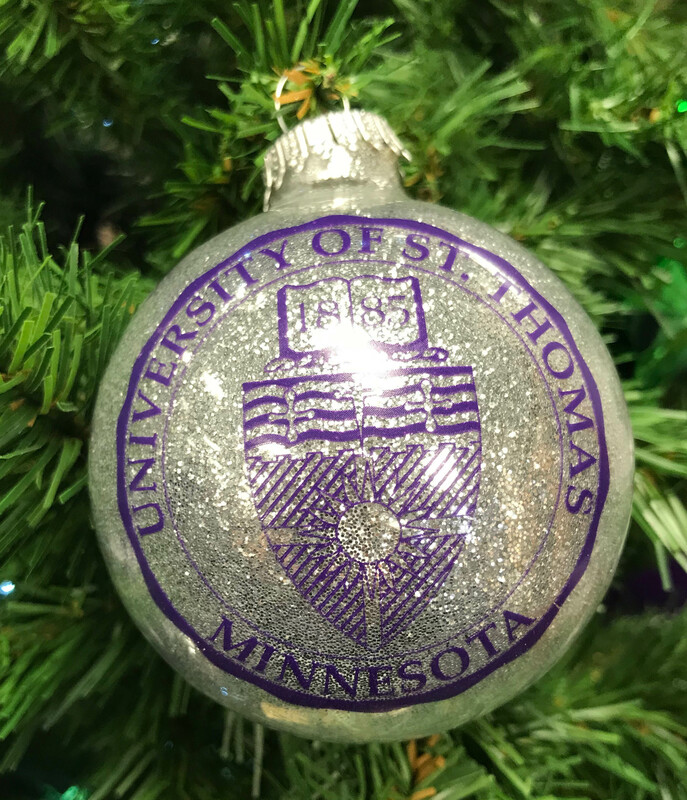 Perfect way to show your Tommie Pride. Design allows tabs to show. 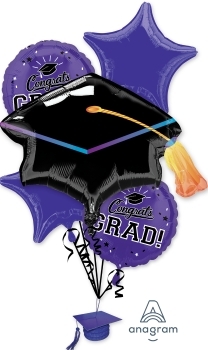 Balloon Bouquet- Graduation. This bouquet includes: ribbons, a decorative weight and 5 Balloons. 2 purple stars, 2 "congrats grad" and a mortarboard. It is over 6 feet tall. It's the perfect decoration to make a statement and celebrate your grad! 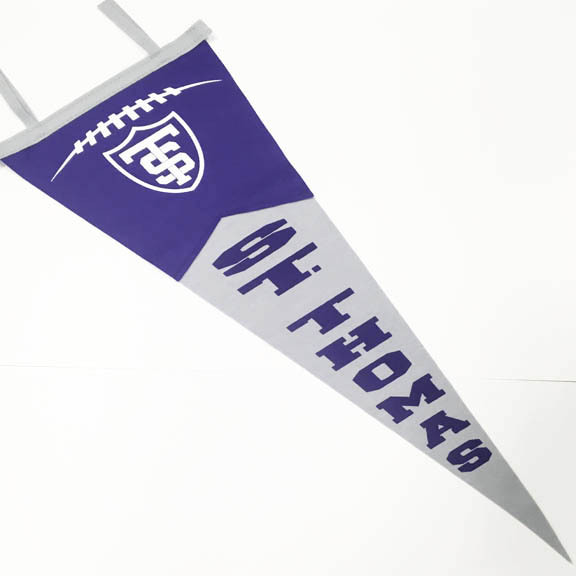 Hang this double sided banner in your window to show your St Thomas pride! 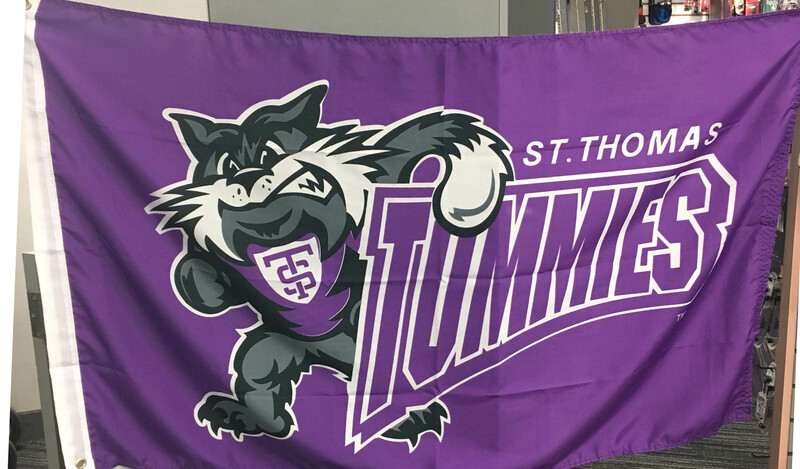 Tommie Tomcat and St Thomas Tommies silkscreened on the banner with a 2" rod pocket and reinforced slits for hanging cords. Measures 30" X 40". 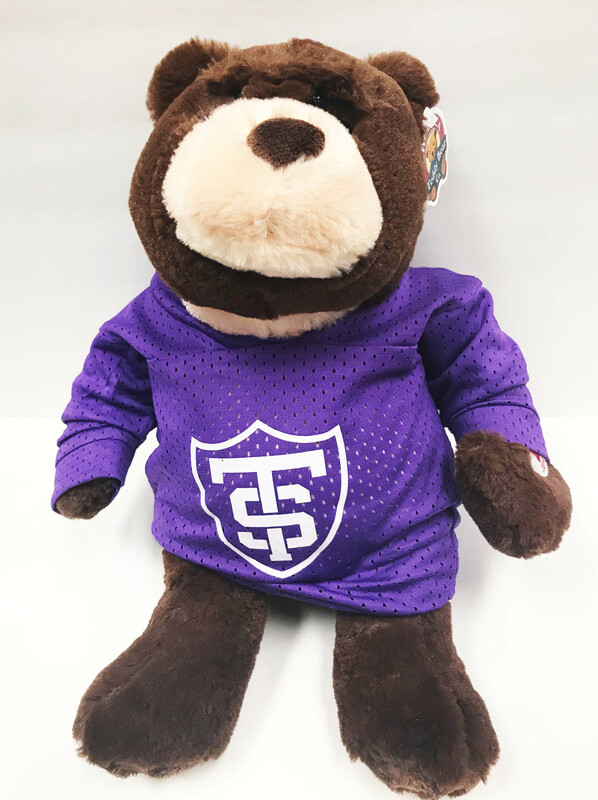 Sarge the talking bear is all geared up in his Tommies Jersey. Sarge really gets into the game with several animated cheers and jeers! Keep safe and styling at the same time. Classic sound of the bell is universally understood and easily comprehended by people of all ages. Lever is easy to engage and the bell creates an emphatic sound with minimal effort. 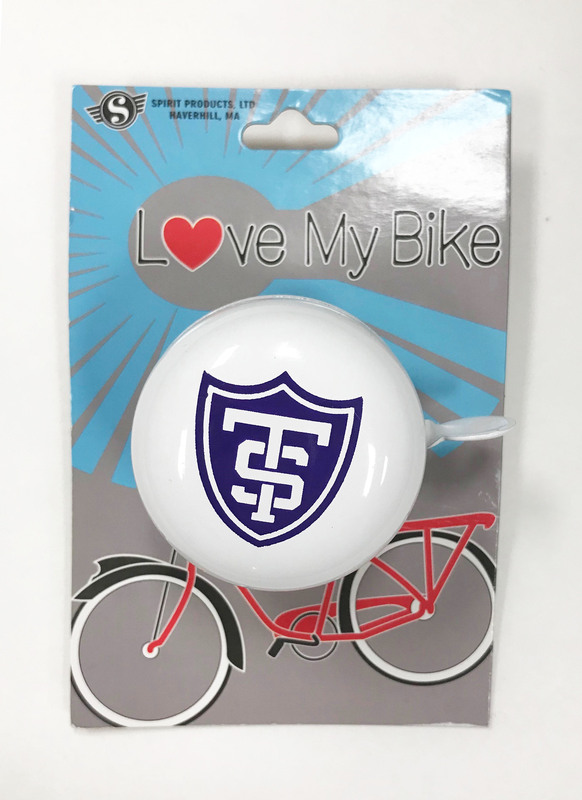 Bike bell that is great for cities with a lot of traffic, on a college campus with a lot of pedestrians, or in the woods where you are prone to crashes at trail intersections. The nostalgic ring will have you smiling. Get a good night sleep or just relax with this cozy, warm and not too heavy blanket. 54'x84' Oxford Sweatshirt-Pro-Weave. Extra Soft, Machine Washable. Get a good night sleep or just relax with this cozy, warm and not too heavy blanket. 54'x84' Purple Sweatshirt-Pro-Weave. Extra Soft, Machine Washable. This is a single, individually packaged, coaster for your Cars cup holder. This popular absorbent stone coaster designed especially for the auto or boat cupholder. Features the St. Thomas arches artwork. •2.5in Diameter •absorbent stoneware •Car coasters soak up condensation. •To remove stains, soak coaster in 1 part household bleach and 3 parts water until stain disappears. Rinse and air dry. 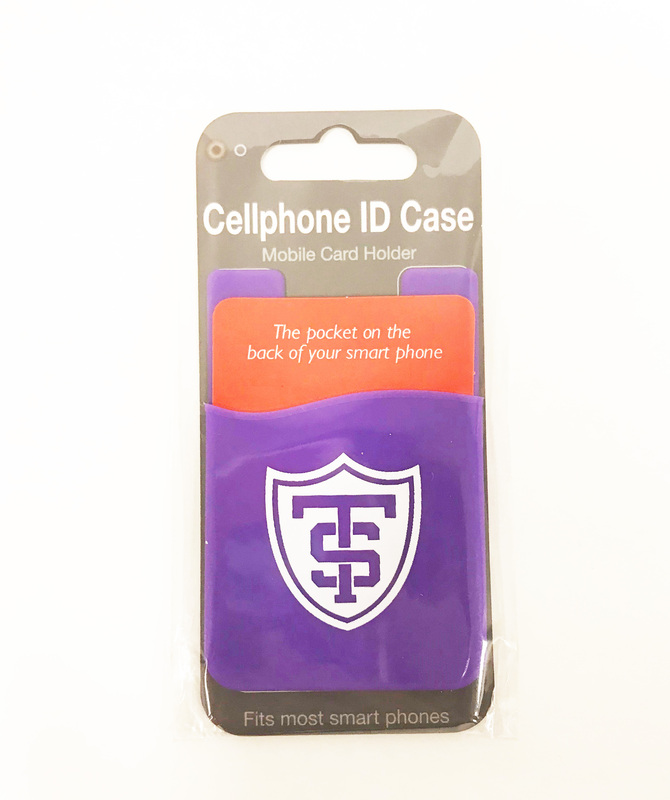 Cellphone ID Case- Self adhesive silicone ID case. Removable without leaving a mark. 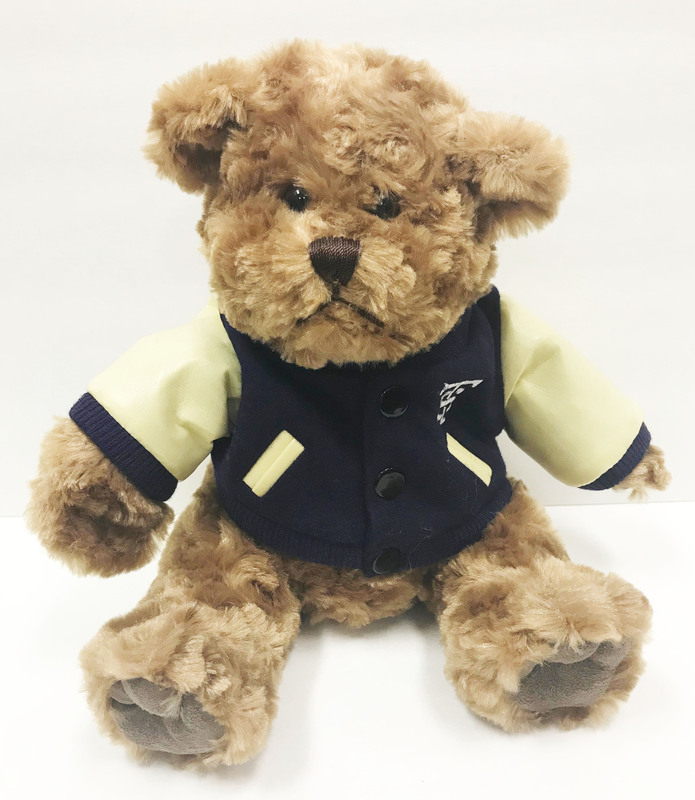 "Spread the St. Thomas Joy" This 10" adorable plush bear makes a perfect Christmas present. 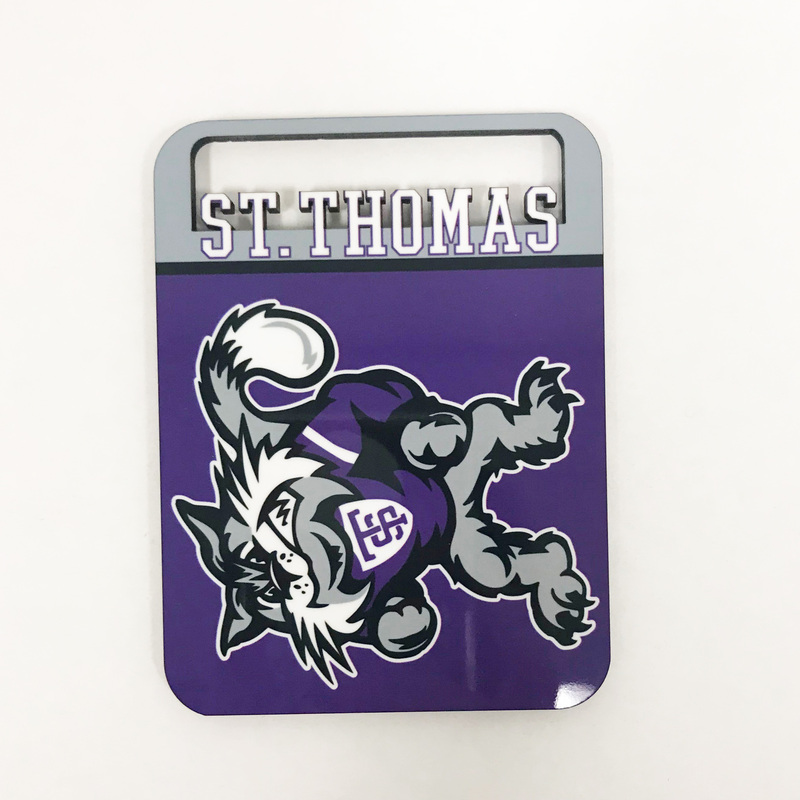 Custom St. Thomas-Ceramic Coaster 4-Pack. Enjoy drinks at the table or on the coffee table without fear of leaving drink rings. 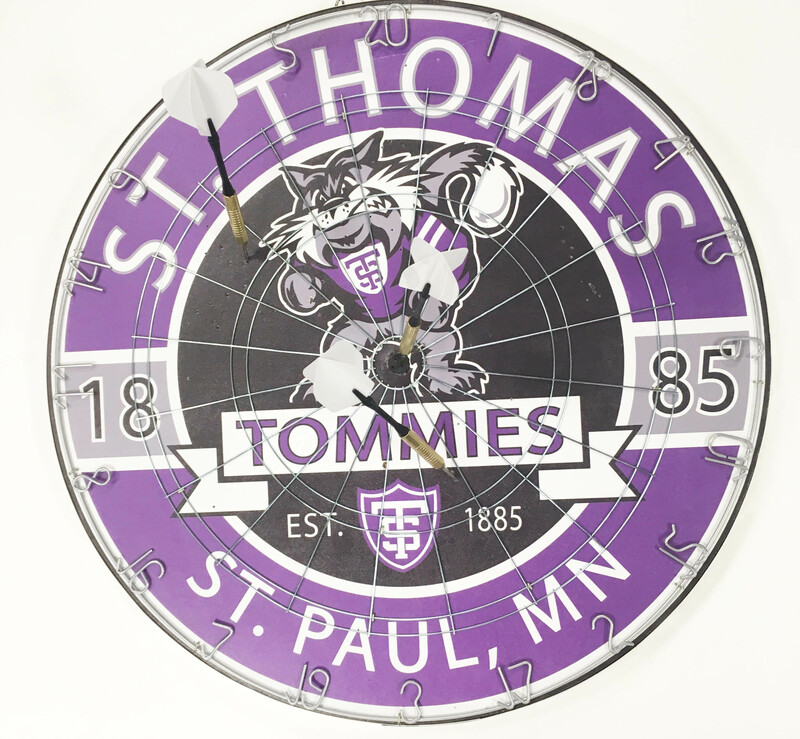 DartBoard- St. Thomas Tommies dartboard by Spirit 17" round. purple, black and white. 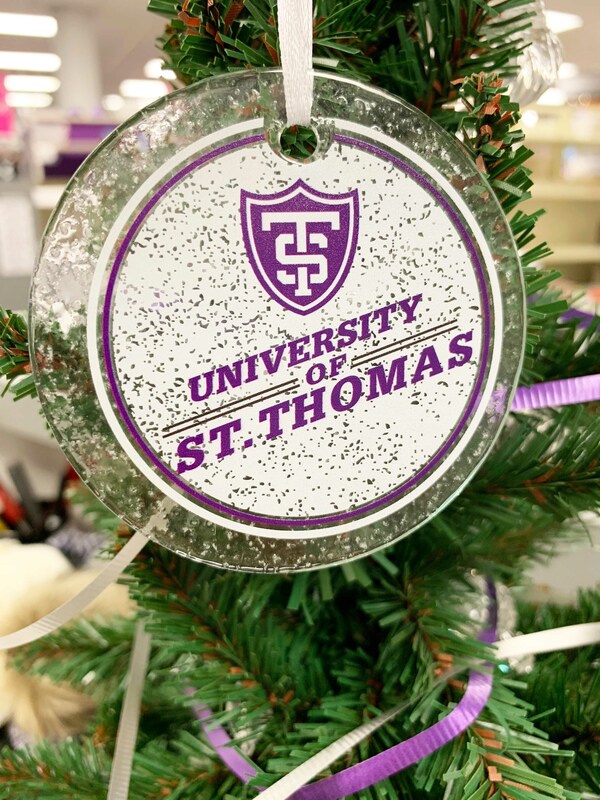 University of St. Thomas Alumni with Shield decal. Clear with purple lettering. Transfer vinyl. 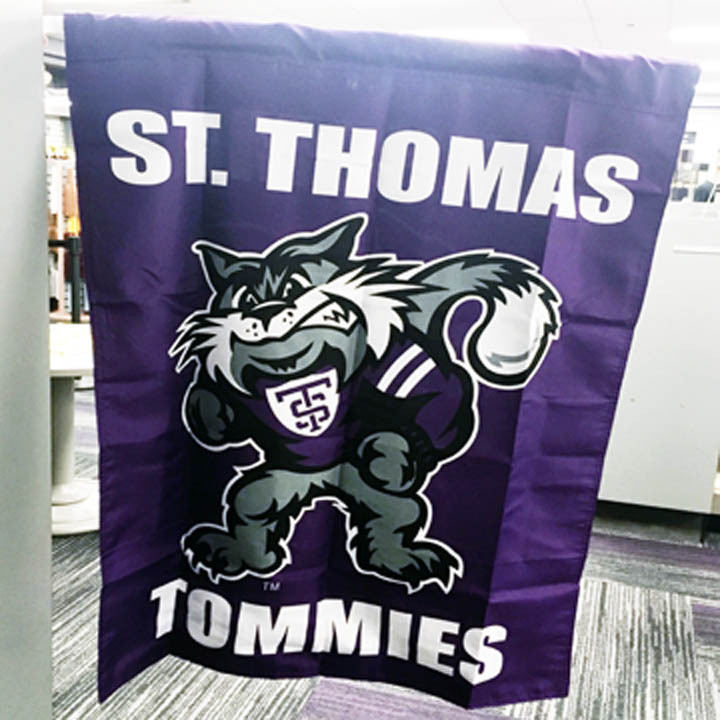 Tommie Tomcat shows his school spirit on this silkscreened flag. Grommeted on the left for hanging on a flagpole. Design is single sided and shows reverse on backside. Measures 3' X 5'. 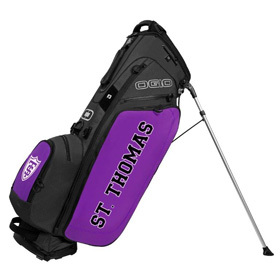 St Thomas is on the course with this golf bag! Purple and black cordura fabrics with design. This item will be available in July 2016! Shipping for this item is $27.00 due to the size of the box. Golf Headcover. Athletic shield embroidered on top of cover. Fits oversize drivers, and has long sock for club protection. GREY WRIST LANDYARD by NEIL. 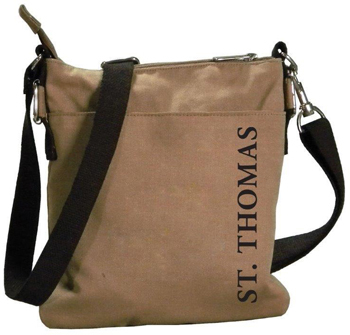 This cloth heathered black wrist lanyard features white screen printed "St. Thomas" with the athletic shield. Large Wood Athletic Shield Sign by Neil. This hanging purple and white painted sign is approx. 12"x12". 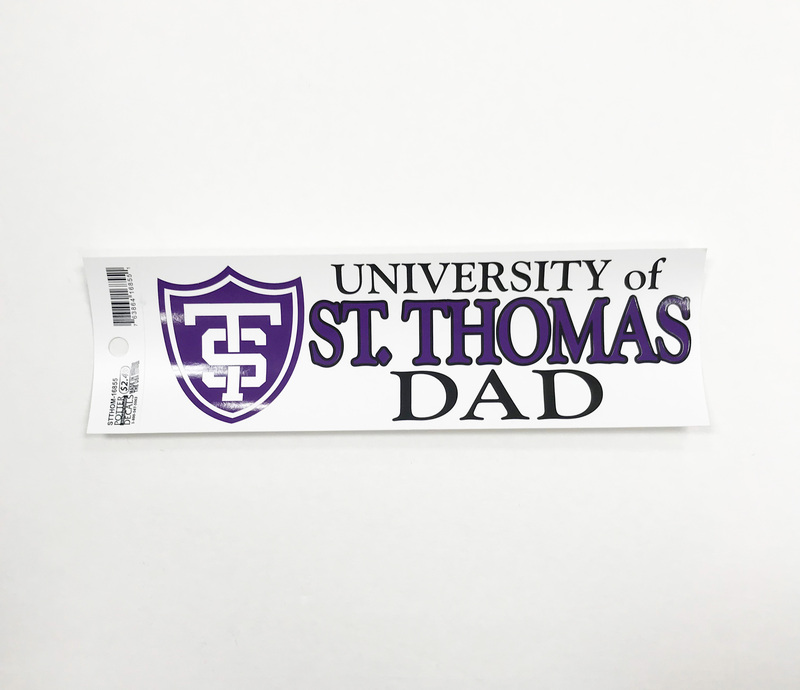 License plate frame- Tommies. Great for students and grads alike! Design allows tabs to show. Basketball- Nike. 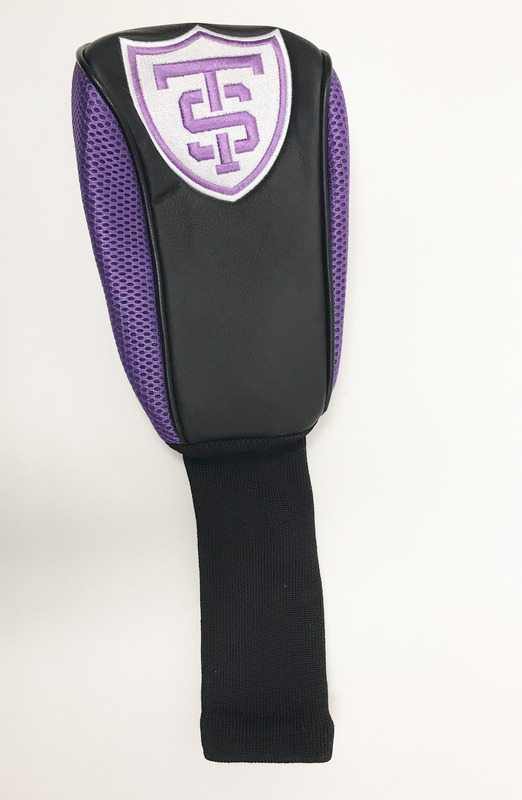 6lb psi with the swoosh, Athletic shield & "Tommies" embossed in white. Nail Polish -2 PK by Spirit. Show them your true colors! Purple and silver. NAILSNAPS by SPIRIT. These custom St. Thomas nail wraps include: 20 nail wraps, nail file + easy instructions for a perfect mani in minutes! No Heat, No mess, No dry time. Lasts up to two weeks. 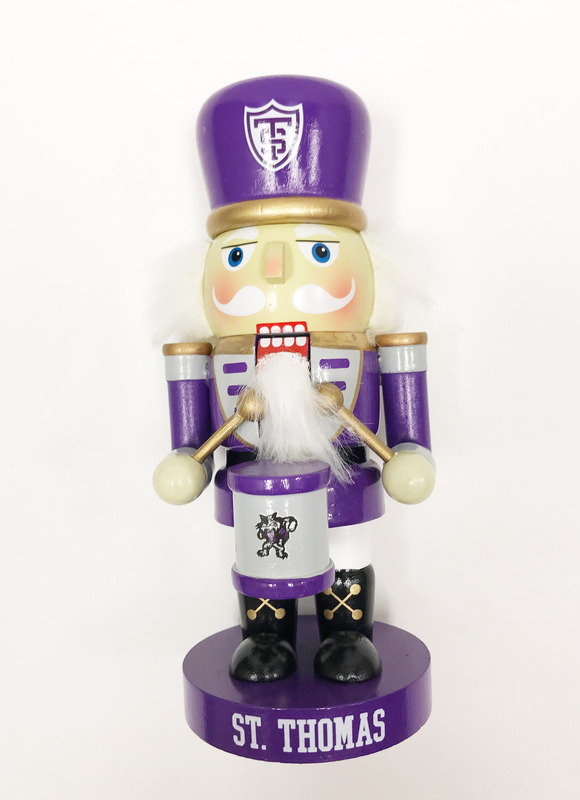 8" wooden nutcracker with a tomcat and athletic shield. Great Christmas gift for Tommie fans and ballet lovers alike. 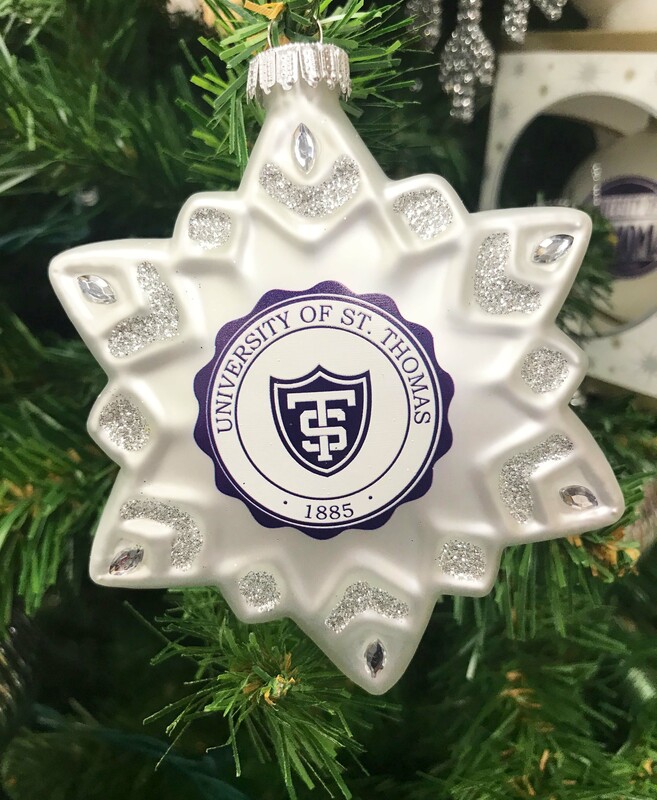 Christmas Round Glass Ornament "University of St. Thomas"
ORNAMENT- Christmas snowflake ornament with St. Thomas seal. Christmas Snowman Ornament with purple hat and mittens and an athletic shield. Drum ornament with athletic shield on top. Black and white side design with silver trim. 3" tall and 2 3/4" wide. A great gift for a grad or alum! 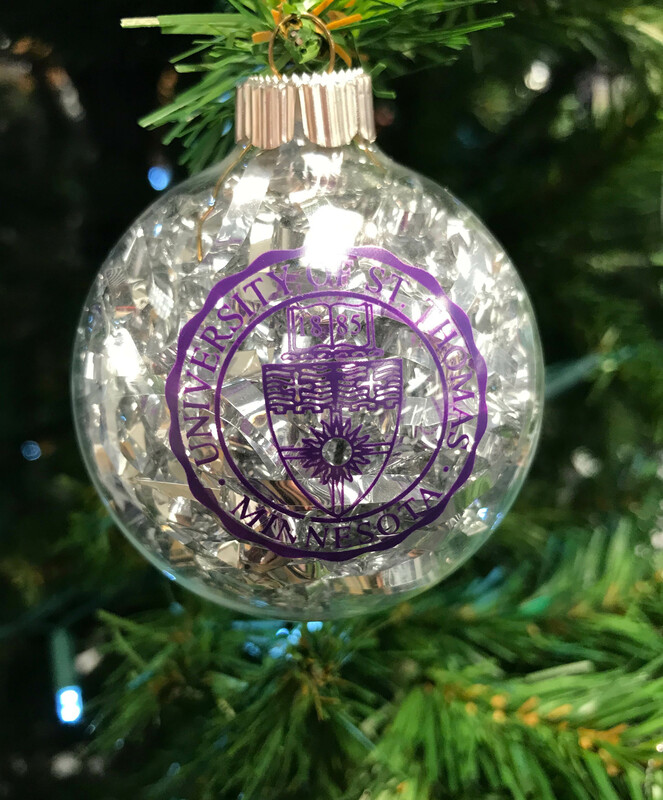 Purple Christmas Ball Ornament with Tomcat and pawprints. 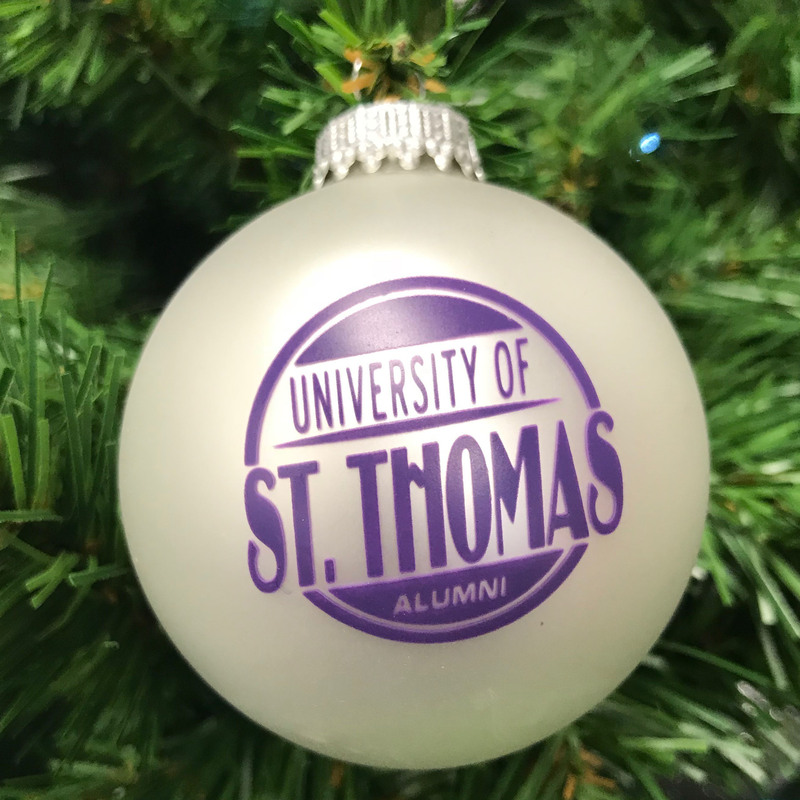 Ornament-cream alumni w/ purple "University of St.Thomas alumni"
A frosted white ball ornament with the shield in purple. 2 1/2" ball. Purple dog bowl. 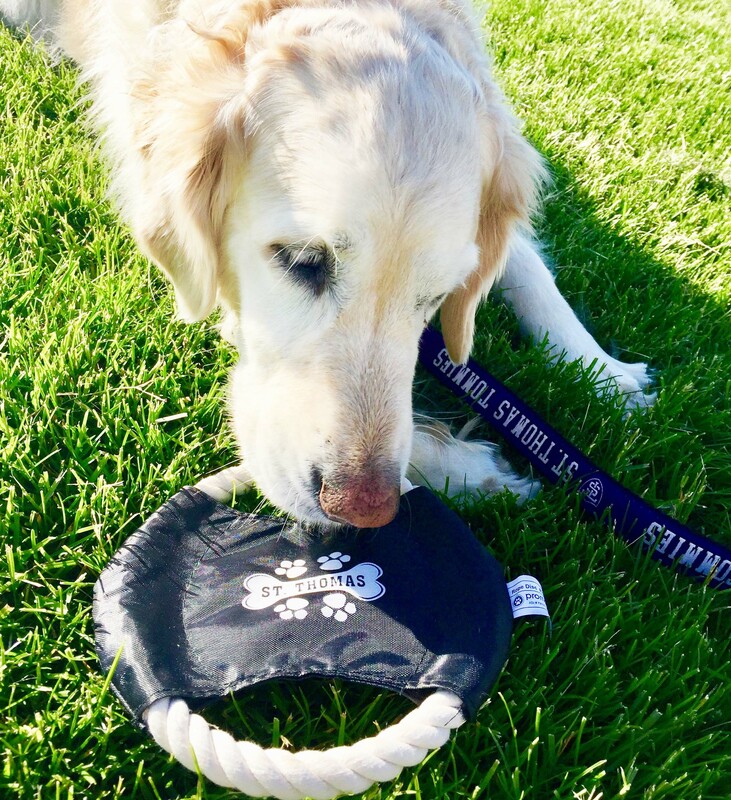 Your pup needs Tommie swag too! 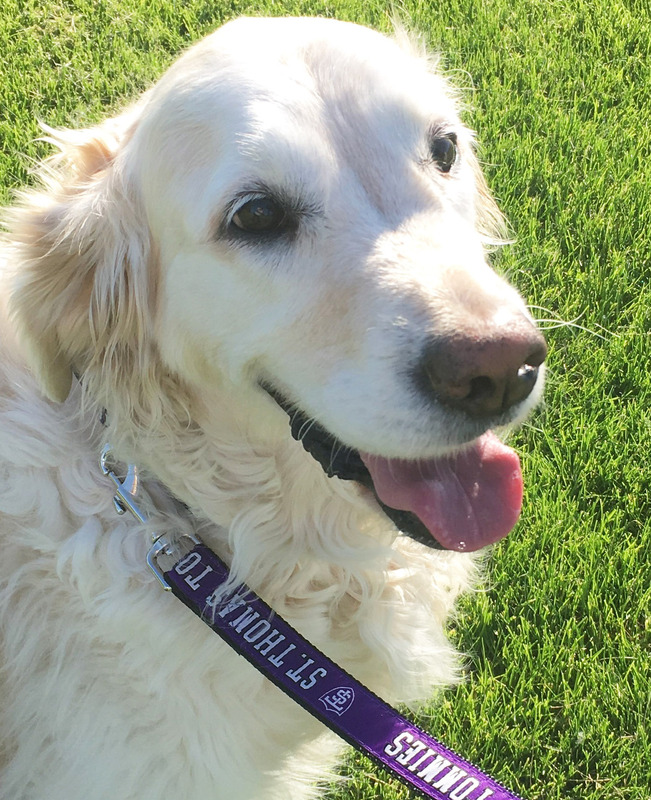 Dog leash- 6 foot purple leash with white lettering. A little swag for their wag! HOT BUY PRICING!! 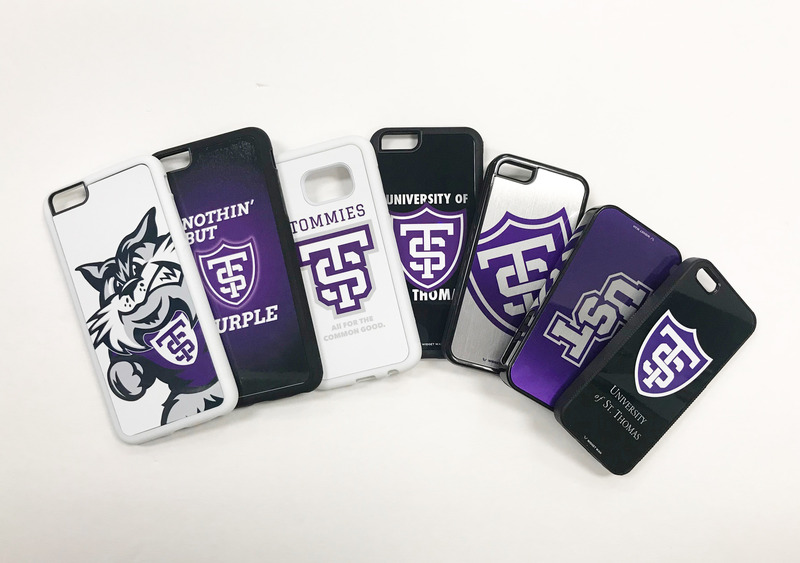 $4.99-$9.99 St. Thomas Custom Phone Cases: iPhone 6, 6plus, 5 5S, 5C, 4, 4S, Samsung: S7, galaxy S5 Such a great deal, you can get a couple! Please select option for Phone cases- hot buy pricing. Pin- Hockey puck lapel pin by wincraft. Hockey Pin by wincraft. Wear it on your hat, coat or backpack.. Metal, painted. 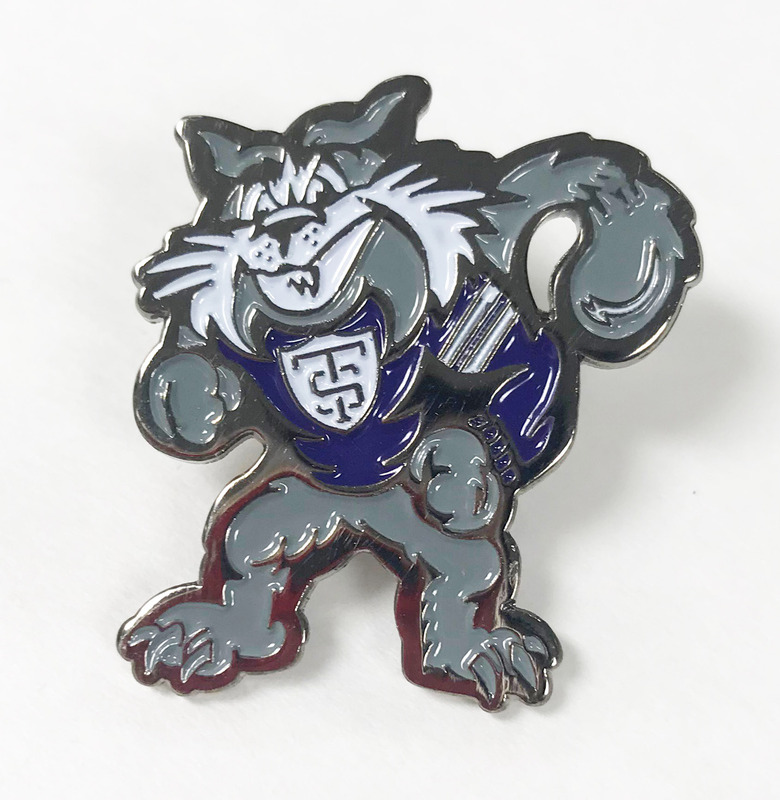 Tommie Tomcat Pin. Wear it on your hat, coat or backpack. Measures approximately 1" square. Metal, painted. If ordering only the pin, shipping charge will be $3.99 and shipped by USPS. Please select option for Pin- Tomcat pin. Please select option for Pinch Me Therapy Dough. 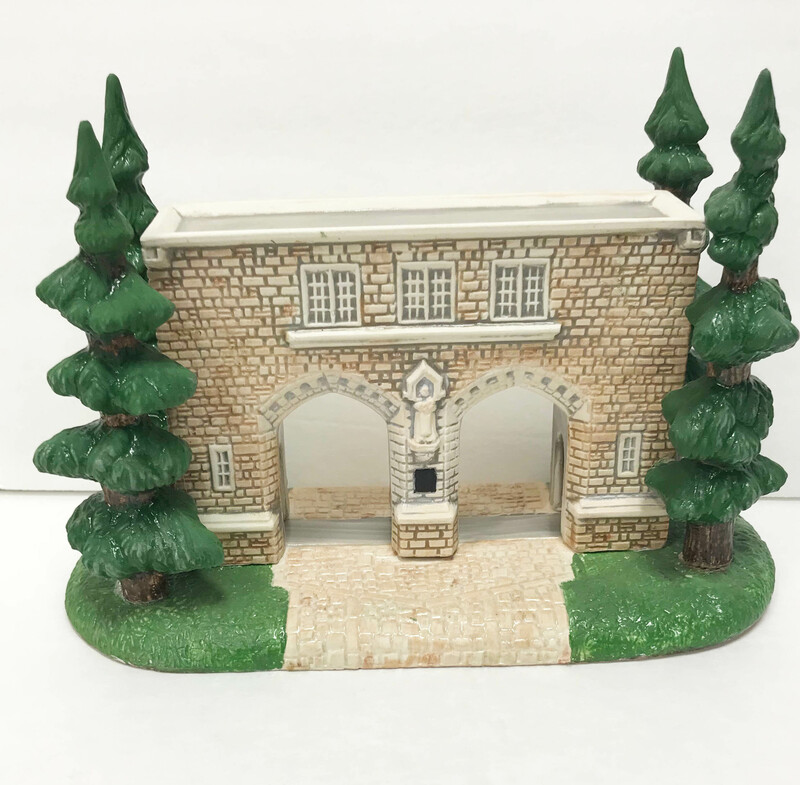 A miniature likeness of the St Thomas Arches in ceramic. A piece to display on a mantle or desk. 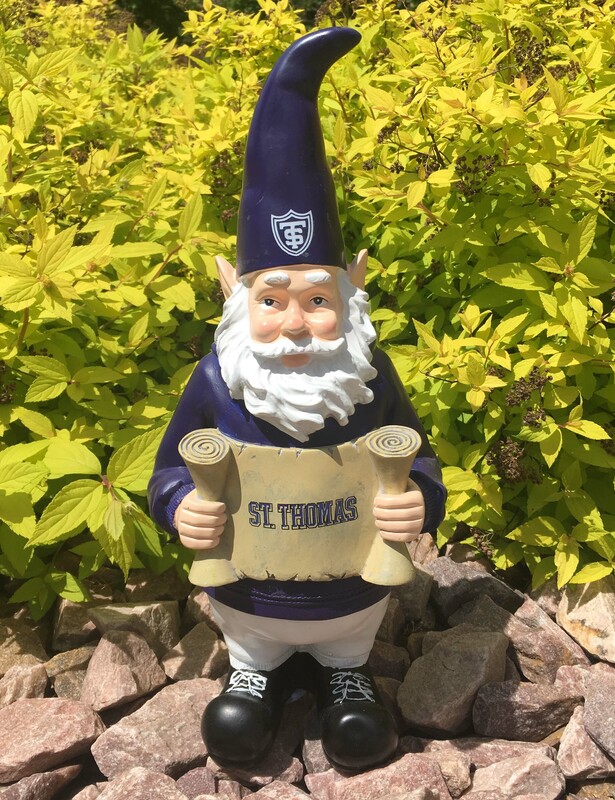 Measures 4 3/4"H x 2 1/5"D x 7"W.
Gnome- St. Thomas 10" tall gnome. Great for garden or display. by Spirit. 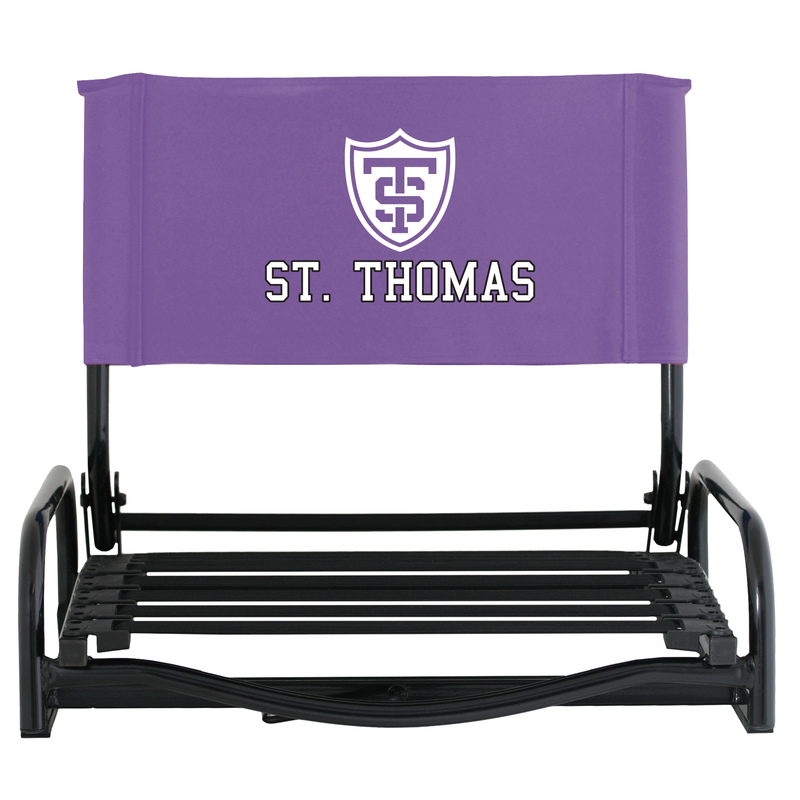 This St. Thomas Chapel Lithograph comes with comes with silver and black matting. Lithograph is 11x7.5. Gnome- St. Thomas 13" tall gnome. Great for garden or display. Please select option for STAX - magnetic building blocks. 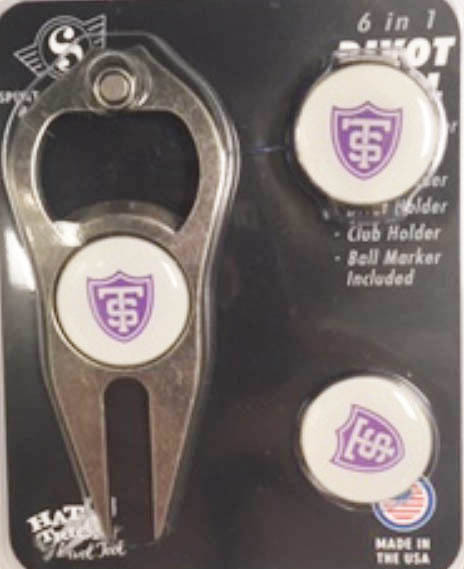 30 White and Purple stickers with the official St. Thomas Athletic Shield. 30 White and Purple stickers with Tommie Paw Print. Tan Canvas Satchel- waxed cotton canvas. messenger style. 8 x 9.5"
2.5x3.5 inch purple and grey magnet. 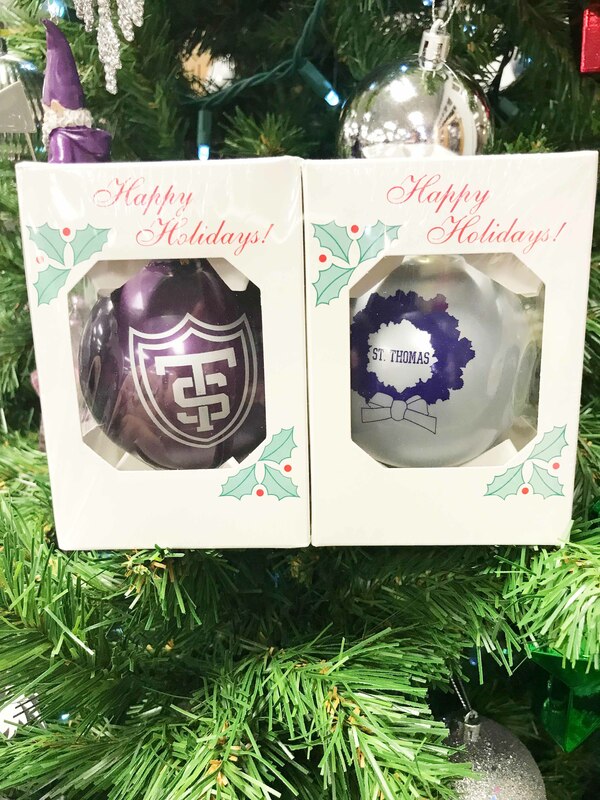 Perfect way to show your Tommie Pride! Tomcat Plug-In Nightlight. Light-sensing technology turns it on/off with change in light. 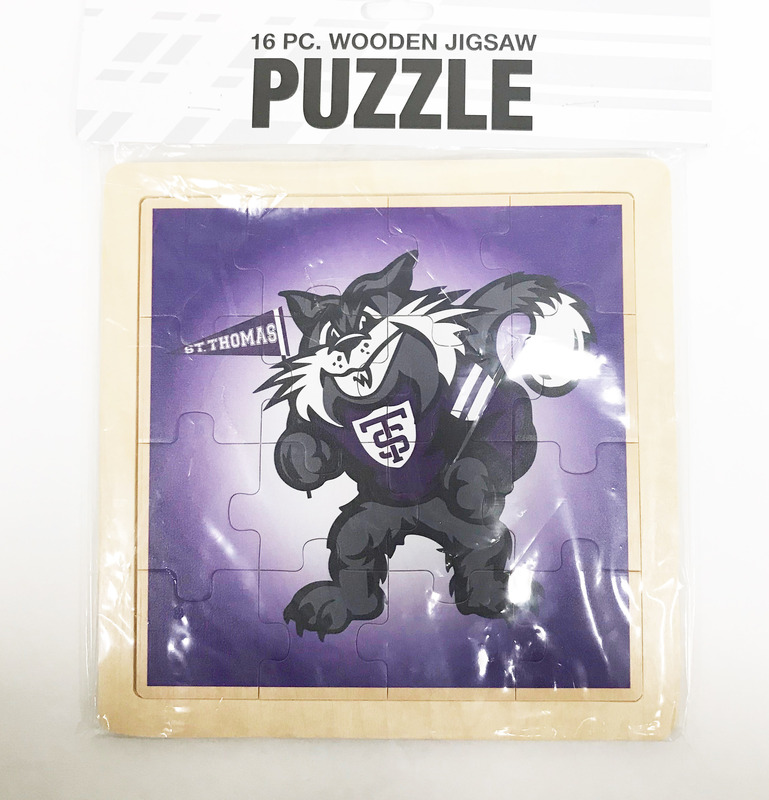 Tomcat Wooden Jigsaw Puzzle-16 Pc. 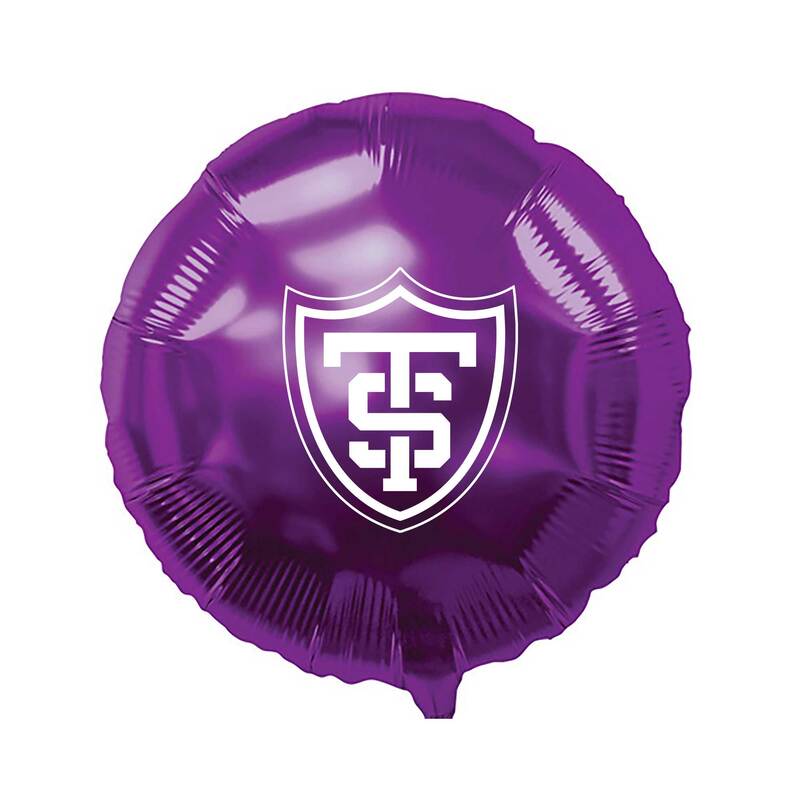 Hang your notes and photos in style with these custom Tommie Magnets. 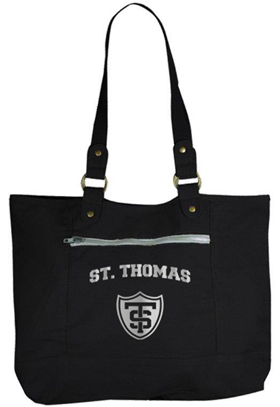 Sideline Tote in black made from our soft brushed cotton fabric-we call it "peachskin". Featuring front brass zippered pocket and brass hardware. 19 1/2" wide x 15" high. Umbrella- Black or Purple or Pink Storm Duds- Pocket. Umbrella- Black or Purple or Pink Storm Duds- Pocket. 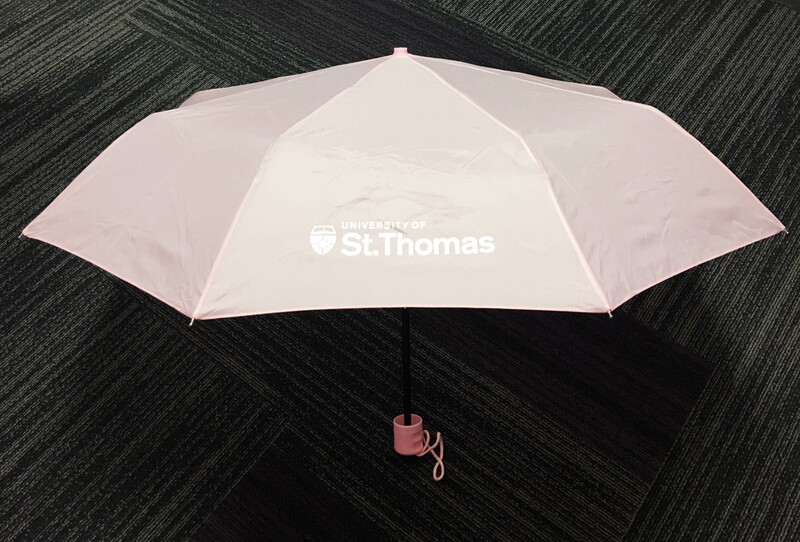 This mini umbrella features a comfortable finger grip handle, small compact design, a high quality lightweight frame, and water resistant fabric. Opens to 42" arch. Please indicate which color you would like in the Customer Notes. Umbrella- Black or Purple Storm Flash. This umbrella features a deluxe swivel flashlight handle, small compact design, a high quality lightweight frame, and water resistant fabric Opens to 42" coverage area. Please indicate which color you would like in the Customer Notes. Umbrella- Black Storm Duds- Cushie This umbrella features a small compact design, a high quality lightweight frame, water resistant fabric, and a soft gel handle. Opens to 42" coverage area. This umbrella features a small compact design, a high quality lightweight frame, water resistant fabric, and a soft gel handle. Opens to 42" coverage area. 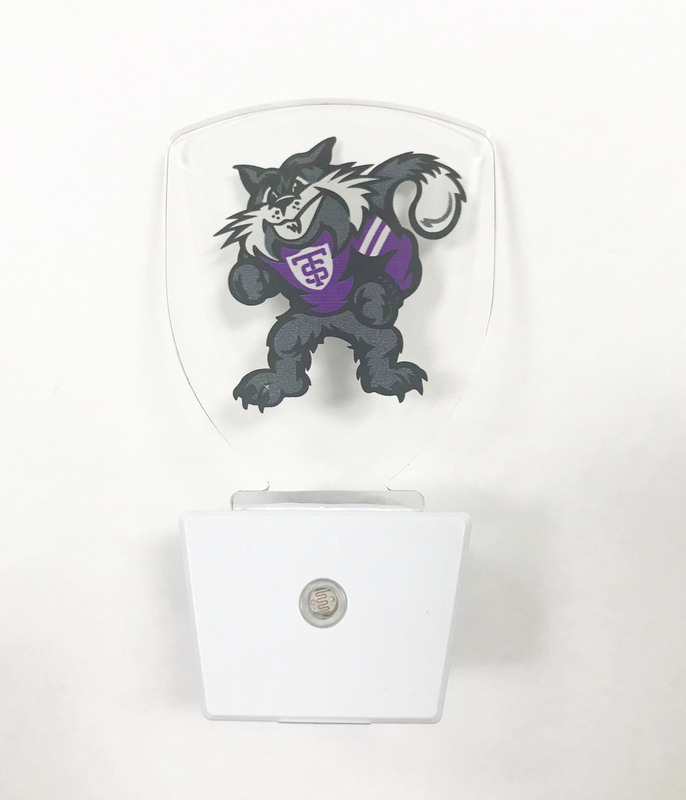 Wastebasket- Plastic purple, grey and white with Athletic Shield. 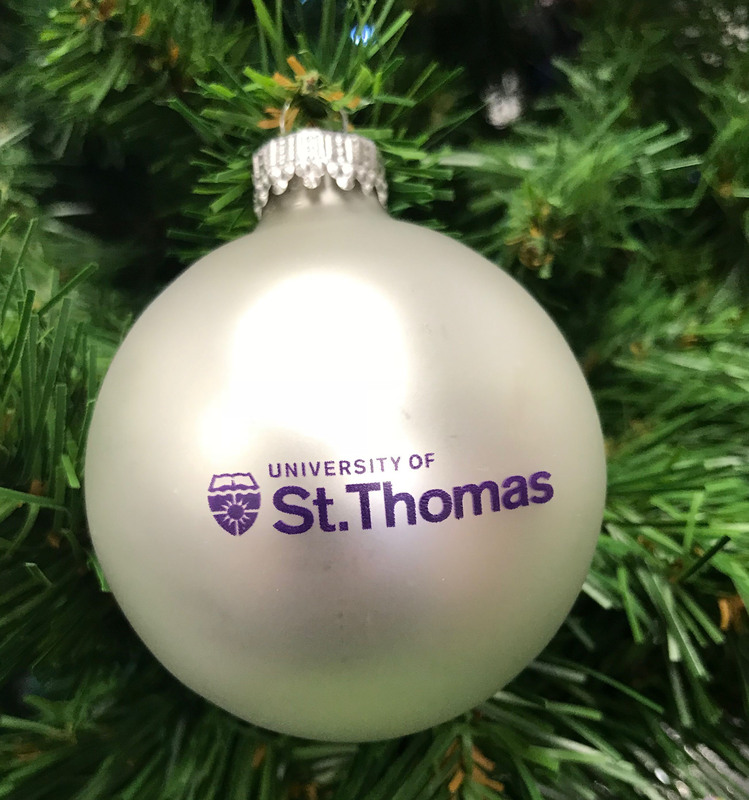 "University of St. Thomas"